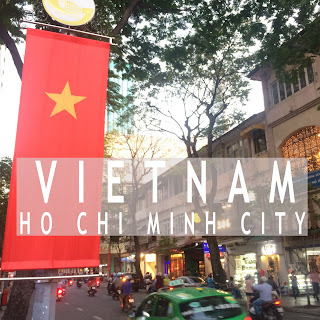 I would like to share my experience in travelling in Ho Chi Minh City, Vietnam. It is a description of what I have discovered and learned from visiting this place and getting information from a frequent tourist and a 2-year stay-in foreigner. Ho Chi Minh City is located in the southern part of Vietnam. This is the tropical area of the whole country. Hanoi - the capital and in the northern part - experiences four seasons. I visited from December 15 - 23, 2017 and these are the following information that I can share with you. Same as the Philippine seasons, December to February months are the best time to visit a tropical place like Ho Chi Minh. These months are windy and you can endure the heat of the sun unlike during March to May which is considered 'summer'. June to November has a predictable thunderstorms and rain showers which is not comfortable to walk outside and explore the city. 4 days and 3 nights are enough to explore the city and its related tours. Vietnam Airlines, Air Asia, Philippine Airlines and Cebu Pacific are the airlines that serve Manila to Ho Chi Minh flights. We used Air Asia as the price on the dates that we visited were cheaper than the others. It takes 2 hours and 45 minutes approximately in travelling. ASEAN Lane is for all citizens who are members of Association of Southeast Asian Nations can line up here for a shorter queue. So the countries such as Philippines, Brunei, Cambodia, Laos, Myanmar (Burma), Thailand, Indonesia, Malaysia and Singapore could easily acquire their visa on the counters free within a specified period depending on your country. All Passport lanes are plenty to cater all the nationalities. Diplomats, and others are shown on top of the immigration counters for such related person or organization. Landing Visa lane are for people who wish to stay longer in Vietnam with their necessary documents according to their country which are listed on the Vietnam's embassy online. For Filipinos, you can check more details on getting your visa if you wish to stay longer on this link. TIP: Walk faster to the immigration area once you've alighted the plane and just follow the counters which are open. There are a lot of people. Few are maybe agents that are waiting already for their clients which may confuse you to where the lines start. But, the new international airport will soon open, hoping that the queue system will be improved. Money changers are located outside the airport once you finished customs check. Just have to ask for the rate as I saw there were none posted from different changers in that area. The teller is fast in talking in Vietnamese-English accent and the zeros reflected from the calculator are a lot that you might think you are a millionaire. They use K as a substitute for thousands. For example: 27,000 dong --> 27K. You just need to change a small money and just change it in city proper. One is in Koi Cha Coffee and Bubble Tea store beside Ben Thanh Market. I also experienced changing my dollar to Vietnamese Dong to a seller inside Saigon Square when I was buying a set of underwear with the same exchange rate on Google. That I think was better than with legit stores because they do not have a cut. Taxis are also convenient but what they consider as trusted in terms of metered travel are the companies, Vinasun and MaiLinh. We also used these most of the time. But other drivers still would want to ask for a tip. Uber and Grab are also being utilized in this city. Just have to purchase a wifi which you can buy in the airport. Take note that there are a lot of drivers who would want to get you as their passengers once you stepped outside the airport. Just go to the left side and you will see the taxi lane. Also, have a note or a picture of your hotel's address. It is hard to pronounce their words which might give a confusion to the driver and can cost more. Give an exact amount of money in paying for the fare. You can see the price in the meter. The drivers might give you a lower change from the metered price meaning you tipped them. There are different types to choose from depending on the number of guests and preferences. Great for couples, elders and businessmen because no need to worry for laundry service, cleaning of room and if included, breakfast is ready. It's all about having some cash to spend! Great for youth in making friends with different nationalities. Single ones can make travel buddies in this type of accommodation. Everything is shared from a room, because some are bunk beds, to a toilet/bath room because this type is cheaper! Great for family and groups to fully enjoy the amenities of an apartment/ unit or a house. Maybe you can also meet the host who is a Vietnamese and learn more about their culture. In our case, we just used a hotel booking app - Agoda - so we could compare prices and also get a discount by being a member and a frequent user of it. It is nice to also check the location of the hotel from the places of interests. For example, if you would like to stay near the bars and be able to endure the noise every night, that's fine. A lot are in District 1 in Bui Vien Street and Pham Ngu Lao. We stayed in Luxury Hotel in Mac Thi Buoi Street. It is near Saigon River and Ho Chi Minh's City Hall or the People Committee Hall and Nguyen Hue Square - along Nguyen Hue. This area has a lot of tourists and it is full of life at night. District 1 is good to be walked on. Just be careful with motorbikes and you'll enjoy the city. The hotel that we stayed is using Type C - the two rounded ends. For more details check this link. As a traveler, it is better to have a travel plug adapter like what I have in the picture. You can buy it in any electrical or Daiso store. Vietnamese use the British way of numbering the storeys/floors of a building. Ground floor is the street level, 1st floor is the first upstairs and 2nd floor is equivalent to 3rd floor in American way. Places to Visit in Ho Chi Minh. It is all about the history of Vietnam focusing mostly on the Vietnam-American War. can be availed by going to a travel agency located along Pham Ngu Lao Street. An interactive way of being aware of the life of the Vietnamese during the Vietnam- American War. You can buy food or just bring some snacks to munch in the bus while travelling. Wear walking shoes and put on some insect repellent. can be availed by going to a travel agency located along Pham Ngu Lau Street. A tour to a local village selling their produce and hand-made products for a cheaper price compared with the ones in the city. The boat ride to a narrow river surrounded by coconut/palm trees and listening to a Vietnamese music and song are the highlights of this tour. A side trip to a Buddhist temple with seven big Buddha statues in different posing emerged to the site is something to admire at. It was the presidential palace of the South Vietnam's leader when Vietnam was divided into 2 ideologies. Vietnam's history is almost similar with Korea's - having North and South, but Vietnam remained as one nation. The bunker is the hidden gem of the palace which you should see. Nguyen Hue street or the Square in Ho Chi Minh where Vietnamese people hang out. In the picture, some Vietnamese wearing their traditional costumes and the skyscraper, Bitexco Financial Tower in the background. Just taking a picture of the exterior of the building and the plaza with of the one of the tallest buildings in Saigon - Bitexco Financial Tower as a background is enough to signify that you went to Ho Chi Minh. At night, the locals like to hang out with their loved ones and friends in this area. You can also try to buy some street foods here. The facade of the notable Catholic symbol of Saigon is something to be amazed of. Same with Nguyen Hue Street, Vietnamese youth and families are meeting and having their picnic at night outside the Cathedral. The Opera has cultural and theatrical shows that you need to pay in order to watch it. In my case, I just took a picture with the beautiful architectural style of the building. The majestic hotel of Hotel Majestic Saigon is renowned for being the filming location of some Hollywood movies if the scenes are in Ho Chi Minh. And just acroos the hotel is the Saigon River park. The view is not interesting at all but if you just want to walk and explore the city, why not try this place. You can see and dine to some restaurants along this area. Great Pho restaurant for starters! They serve with generous leaves of different variants - coriander, mint, etc. Pho Bo is a must! In this restaurant, you will see pictures of the former US President Bill Clinton dining when he visited Ho Chi Minh in the year 2000. Pho is their specialty. Rice Noodle with Pork and Sauce (Bún Chả) - my fave! Great ambience and food! A lot of tourists dine here. My Vietnamese student and her friend let me try on their food as they said it is popular and affordable. I ordered rice noodle with pork and it was so delicious! Dishes at 3T Quan Nong in Ho Chi Minh Vietnam. I love these meals! Great outdoor rooftop barbecue grill dining! Best for a large group meal. Best to eat at night. I like their beef and prawns. So flavorful. Ca Phe Sua Da of Fanny Ice Cream Cafe, Ho Chi Minh, Vietnam - a must have! Ca Phe Sua Da - Vietnamese coffee with condensed milk is what I like the best! They also have this set of ice cream flavors that you can enjoy with your friends. Just beside the Ben Thanh Market you will see this haven of food stalls. There are varieties of cuisines that you can select. There are many foreigners dining here. This walking street has a variety of restaurants, coffee shops and bars that you can choose to satisfy your palate or hunger. The area of Sky Garden condominium in Phu My Hung in District 7 has numerous Korean restaurants as the place is like the home of Koreans. Korean + Vietnamese cuisines are a great combination to fully enjoy your Asian taste. For more information, check this link. Japanese restaurants can be seen in this area as this is a Japanese town. I walked around this mini town. I saw a lot of entertainment hubs which are catered to maybe, Japanese men or single foreigner man. For cheaper food price, always look for a restaurant that has a majority of Vietnamese than tourists. Some people can speak English but sometimes you will do a lot of body language. Be precise in ordering food. From my experience, it happened many times that they double the food order. I think that is their way to get more income. So, you have to make sure that the server understands you. There is a FIXED PRICE sign in some stores which means you cannot ask for a discount. For souvenirs, cloths, nuts and coffees. Try also eating at the food stalls for a cheaper yet delicious authentic Vietnamese food. Saigon Square is in the left side in this picture. It is located at the corner of Le Loi and Nam Ky Khoi Nghia streets. for real leather, factory-priced designer brands. I forgot to get the stall number which she sells designer brands products that are manufactured in Vietnam. If you happen to see Koreans and Japanese meticulously checking the bags and wallets, it might be her. for sportswear of famous sports brands which are made in Vietnam, this is the place where you can find great quality but cheaper goods. Lots of tourists from different nationalities are haggling to these stores. For a vast selection of coffee and tea to give as presents to your loved ones back home, this is a great store to buy such. There are a lot to see in this lively and developing city. I really think the weather, the flavorful and sumptuous herbs and spices of authentic Vietnamese dishes and the energy of the Vietnamese in Ho Chi Minh that make the city alive are the reasons why foreigners keep on visiting the city. I would love to come back again and eat and drink more of their cuisine. Ready. Set. Go - to this wonderful city. and Share - this information.